GENM announced to expand its footprint to U.S. by acquiring a prime seafront property in Miami Florida for US$236 million. The acquisition is seen as a possible precursor to the construction of an integrated casino resort in the event that there is legislation enacted to allow “destination resorts” in Florida. GENM has also publicly stated that it would be willing to invest as much as USD3 billion in an integrated casino resort in Miami. Funding is not an issue as GENM has about RM5.3 billion (including RM2.1 billion AFS financial assets) cash or cash equivalent. GENM’s triangle consolidation since mid March will end soon in anticipation of a triangle breakout. As GENM has reclaimed back above the long term uptrend line support (refer to weekly chart) and consistently staying above the daily lower Bollinger band support, we believe the bulls have the upper hand. 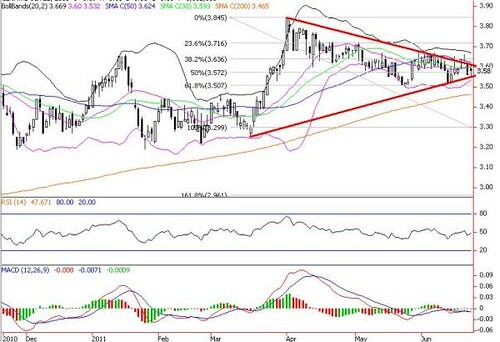 Upside resistance targets are RM3.67 (upper Bollinger band), RM3.72 (23.6% FR) and 52-week high of RM3.84. 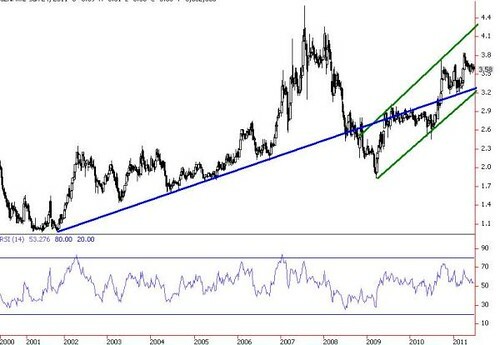 Medium to long term upside target is RM4.10 (upper channel-weekly chart). Cut loss below RM3.47 (200-d SMA).